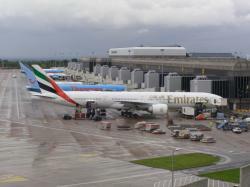 Manchester International Airport is situated just ten miles from Manchester City Centre and has good transport links to the Airport whether it’s by Taxi, Coach direct from many regional points into the Airport, Rail where trains arrive into the centre of the Airport, or by car on the M56 motorway where departing passengers must exit at Junction 5. On arrival there is a large choice of parking spaces either in the Long or Short Stay Car Park, there is even an opportunity to top up with fuel at the 24hour Petrol Station also on site. Or for ease there is always Valet Parking…… The Airport opened commercially in 1938 and during the Second World War saw thousands of Airmen from the Allied Airborne Forces trained here, today however the bulk of passengers are comprised of Business and holiday passengers alike with numbers rising to twenty four million in 2007, there are three terminals all offering good facilities such as Baby Changing, Bureau De Change and ATM’s that accept all major Debit and Credit Cards. The Disabled Passenger has been well catered for with dedicated parking spaces, specially adapted toilets, Induction Loop and Mini Com, together with wheel chairs and motorised buggies for those who require it. There is a wide and varied choice of shopping on hand and of course Tax and Duty Free Perfumes, Wines, Spirits and Gifts to lighten any wallet or purse. The Restaurants, Bars and Cafes offer something for everyone and most have Children’s menus and high chairs available. For Business Travellers there is a choice of Executive Lounges that offer drinks, snacks, Fax and Photocopying for those who wish it. Car Hire Desks are in the Arrivals Halls, and for advice there is even a Walk In Medical Centre and Play Areas for smaller flyers.